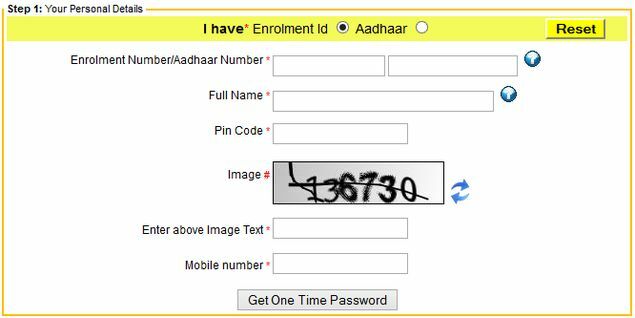 Aadhaar Card Download online as e-Aadhaar letter for Aadhaar Card Printout by using Enrollment ID Number from UIADI Resident portal…. The Unique Identification Authority of India is given the chance to download Aadhaar Card as eAadhaar Letter Online, and the Aadhaar Card Download available in two ways from Resident Portal of UIDAI with using Enrollment ID or 12 Digit Aadhaar Number in simple steps. The Citizen of India who has Aadhaar Number, who has submitted for aadhaar update or corrections and who need to download eAadhar Copy they can follow the simple steps to get Aadhaar Letter Online. 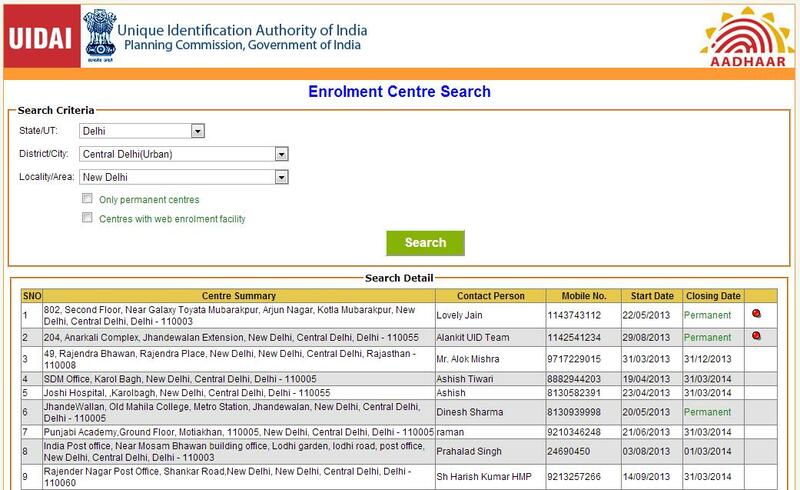 The Indian Citizens who have already enrolled at enrollment center and the people who have already 12 Digit Adhar Number they can download eAadhaar Online in two states with using EID and UID number from the Resident Portal of UIADI from the following steps. Everyone who have UIDAI enrollment slip, they can download the Aadhaar Letter with providing their enrollment details like Enrolment ID Number, Time, Full Name of Candidate, Pin code and Registered Mobile number from the following steps. 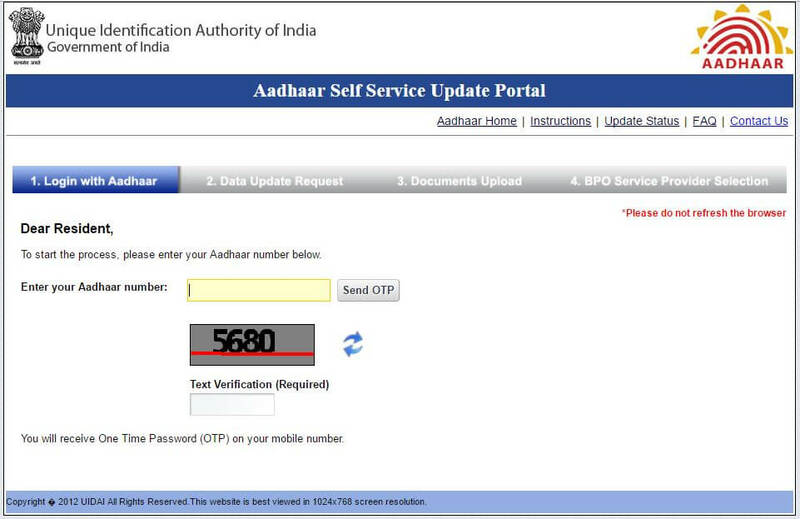 Then you have to get UIDAI OTP to your registered mobile number, check and enter at the Enter OTP Area. Now Click on Validate and Download Option to download your eAadhaar Card as a Pdf File Format to take Aadhaar Card Printout. That’s it open the file with entering your Pin Code as a Password because the UIDAI eAadhaar is Password Protected Secure Pdf file. 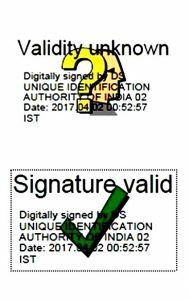 Validate signature and take a copy of print and use as official Aadhaar Card and it is valid for all government and private authorities in India. The Unique Identification Authority of India is given the option to citizens who have already Aadhaar Number and Who have lost or forgotten and who have not received by Post they can download by using their UID as per following steps. 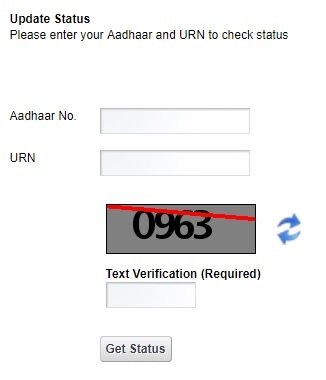 Then you have to get UIDAI OTP to your registered mobile number, check and enter at the Enter OTP Area. Click on the Validate and Download Option the eAadhaar Downloaded as Pdf file, open the letter and Validate than take a copy of printout or Xerox to use at all Aadhaar Related Services Across in India. What is the Aadhaar Card Pdf Password? 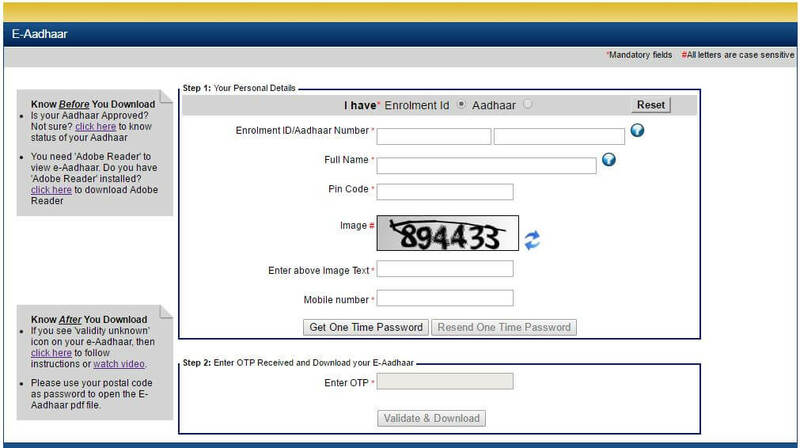 The UIDAI has setup your eAadhaar Card Pdf with the Secure password, and the Aadhaar Card Pdf Password is setup with your area Postal Pincode, you can the pin code on the EID and enter the PIN Number to open Secure Aadhaar Card Pdf Password. I have already downloaded my Aadhaar Card Online, I will download Again? Yes, the UIDAI has given the chance to download multiple times, you can download your eAadhaar online unlimited times without errors, there is no issue. I have EID and I have not registered my Mobile Number, is it Possible to download my UID? You can able to download after updating of Mobile Number to your Aadhaar Number, you can update your mobile number at any Aadhaar Center, After then you can download from the resident portal, it is the best way. I Have lost my Aadhaar Card and I have forgotten my enrollment ID slip also, how to recover my aadhaar card? Yes, you will recover your forgotten Aadhaar Number by visiting nearest enrollment center, they will help to get duplicate aadhaar card by using your biometrics like fingerprints and Irish, it is the best way. My eAadhaar Letter Show Signature Validity Unknown, is it valid? Once the UIDAI issued 12 digit Aadhaar Number, it is valid at all aadhaar related services, and you can also validate the Signature through Adobe reader options. I have to Update my Aadhaar Card with Changes of name corrections, Now I will download e-Aadhaar with modified details? Yes, One UIDAI has approved your corrections you will download e-Aadhaar with latest updated details, you can download and use any ware. I have Submitted my aadhaar number for corrections, is it possible to download before update? 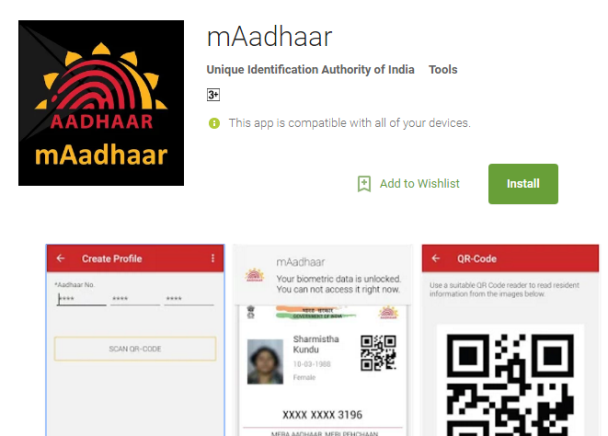 Yes, you can download your e-aadhaar any time and you can carry your number through mAadhaar App, but the changes will appear after successfully update of your aadhaar number, and both are valid for all services related to Aadhaar. Aadhaar Card Update – Aadhaar Data Update, Changes of Aadhaar Card Details through Aadhaar Card Corrections or Modification of Aadhaar Details Name, Address, Mobile Number, DOB and etc..
Aadhaar Card Modification is most important if you have to need any corrections in your Adhar Data, mistakenly you have getting Aadhaar card with (misspelling) spelling mistakes or wrong information or any errors like Name mistakes, Wrong or incorrect Address, Wrong Date of Birth, Not updating of Mobile Number or Email Address, you need to modify your adhar data with Aadhaar Update. The UIADI is given the Aadhaar with 12 digits unique identification number and is very important to get any government issued benefits and make tractions and all in the country. The Unique Identification Authority of India (UIDAI) is given the chance to change or modify Aadhar Data with Aadhaar Online Services, this is self-service to change Aadhar Card Details through UIADI portal in following ways. How to Update Aadhaar Card Details Online for Name, Address, Phone, DOB and etc. The Unique Identification Authority of India has given the chance to change or modify Name, Address, Phone, DOB, Gender and Email Number through Aadhar Update Online Service to make changes or corrections in Aadhaar card data, this is a self-service system to make changes with providing Proof of Identity document (soft copy) for Aadhaar card name change/correction/surname change online. We have given step by step process to make corrections in your Aadhaar, can follow to update your details. After clicking on the link you need to Submit your update/ correction request please CLICK HERE link than you have seen following screen. Now enter your 12 digits Aadhaar Number and Text Verification (Required) than Request for Onetime Password (OTP) with clicking send OTP option. The UIADI Aadhaar OTP will be sent to your registered mobile number of UIDAI if you have not registered mobile number you need to visit nearest Aadhaar enrollment center to update your Aadhaar details. Now login with entering the OTP number, and select which is you need to change ex: Name, Address, Date of Birth, Gender, Mobile & Email as per the following screen. Select which one you need to change, and you can change all details with one correction, select and modify the details and submit, now you can be seen the screen with submitted changes in a preview as per the screen. Now Upload Scanned documents soft copies with self-attested Proof of Identity document for Aadhaar card name change/correction/surname or any related to your modification issued by state or union government. 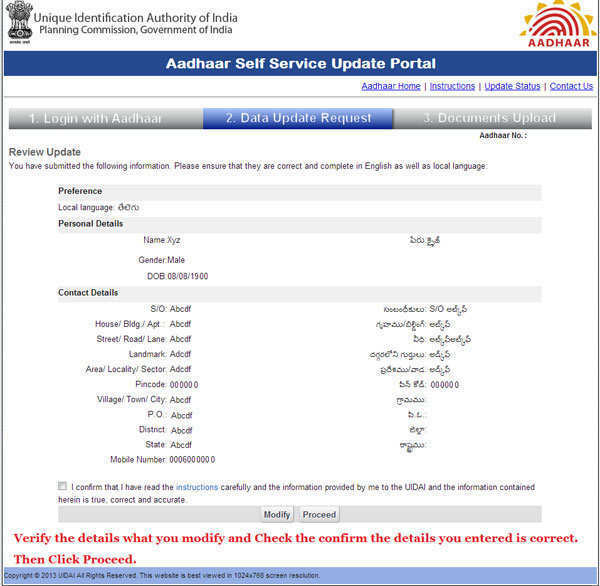 After Successfully Submitted a request for Aadhaar Data Update Online, you will get a reference number to check the status of your modification request to your registered mobile number, after successfully approved your modifications you will get new Aadhar Latter with latest details shortly and there are no changes in your Aadhar Number. The Unique Identification Authority of India has given the service for who has not possible to change online and the rural and other candidates to change their details through sending an Aadhaar Update Forum with attaching required Xerox copy of Identification Proof. Everyone can visit nearest UIADI enrollment center to get Aadhaar services, you can update your Aadhaar card details Name, Address, DoB, Gender, Mobile & Email) & Biometrics (Finger Prints, Iris & Photograph with providing of original documents if identification proofs issued by state or union government, and the service available with free of cost. 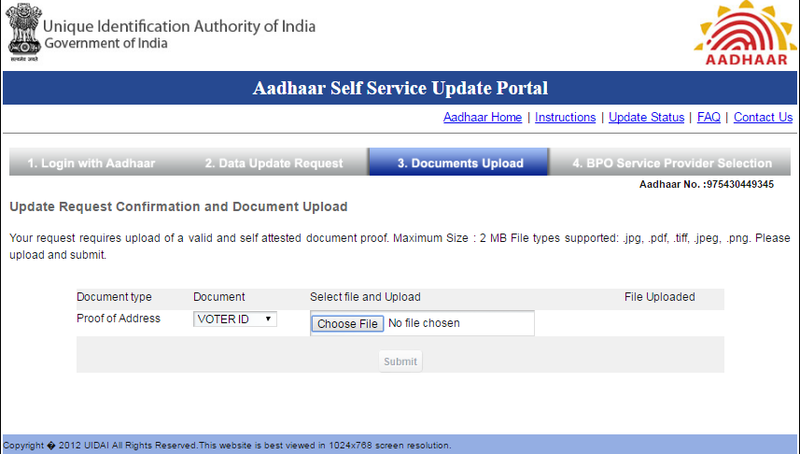 Is it Possible to Update my Aadhaar Details without Uploading Documents through online Self Service Update Portal (SSUP)? The UIADI will approve the Aadhaar Corrections after Manually Verification of Identification Proofs, After Successful Verification, you will get Update Aadhar Card with latest Details, So there is no possible to Update without submitting ID Proofs. 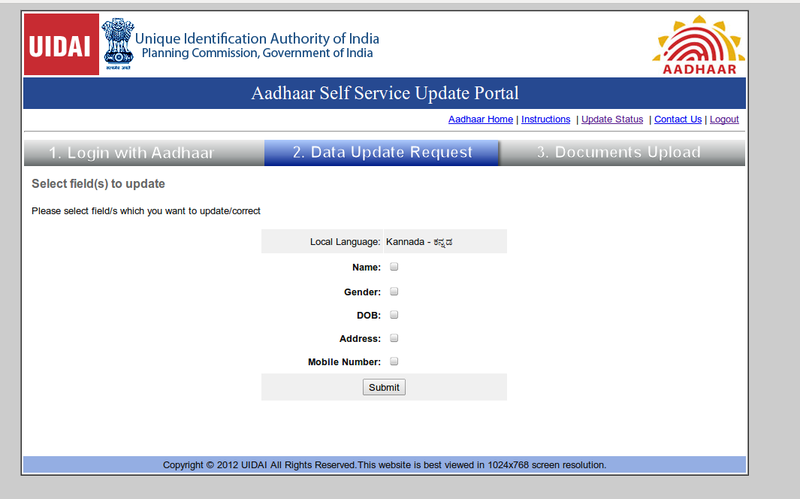 I have to Update my Aadhaar Details through SSUP, how many days to get new Aadhar Card? The UIADI will Approve and Update your Data within 10 to 20 days time pried, maybe the process will be complete before or after a week and the service depend on heavy requests to delay. Once you have approved the changes you will get an SMS with complete details and if you have not submitted valid documents you have no approve. I have Submitted Aadhaar Card Changes for my Name, Address, Date of Birth, Gender, Mobile Number Change, but it has not Approved, What is the Problem? In Case you have submitted invalid or incomplete documentation, the changes will be denied me the UIADI, please check your reference ID number status to get complete details and resubmit with valid proofs or visit nearest enrollment center. Is it possible to change Finger Prints or Biometrics through SSUP? No, there is no possibility to change Aadhar Biometrics through self-service aadhaar modification system, you need to visit nearest enrollment center with valid request to change or update your fingerprints, Irish or any biometrics through Aadhaar Card Update. I have to Submit my changes by Post, but I have no update on my corrections? In order, your Aadhaar Card modification will approve, if you have submitted valid documents please wait, or visit nearest Common Service center to update your data. I have successfully updated my Aadhaar Card, How to get new Aadhaar Card with latest details? The UIADI will be sent new adhar letter to your resident address by post and the details will be sent to your registered mobile number, and you will download e-Aadhar card through online from UIADI Resident Portal. There is no possible to Update without OTP number, the Onetime Password will send only to register a number of Aadhaar Card, So you need to visit Nearest Aadhar Center to Update your new Mobile Number then you can update with SSUP. There is no fee to update your aadhaar details at any enrollment center and all Aadhaar Services are free of Cost for Aadhaar Card Update.